ENSENADA, Baja California, Mexico—Already known as the ‘Desert Racing Capital of the World,’ Ensenada has added another jewel to its crown as SCORE International has announced a new race will be held in the growing sea-side port on the Pacific side of Mexico’s Baja California peninsula as part of the official four-race schedule for the 2019 SCORE World Desert Championship released today by SCORE. Featuring all four races in Baja California, Mexico for the fourth time in the storied history of the World’s Foremost Desert Racing Series, the events will all be taped to air domestically as well as being syndicated internationally. The Inaugural Lucerna SCORE Baja 400 in Ensenada, the newest event on the SCORE World Desert Championship schedule, to be held Sept. 18-22, 2019, will be the third SCORE race to be held in Ensenada. The Lucerna SCORE Baja 400 is being held in 2019 between the vastly popular SCORE Baja 500 and the venerable season-ending SCORE Baja 1000. In July, prominent Mexican hospitality company Lucerna Hotels & Resorts entered into a sponsorship agreement to be the Official Hotel of the SCORE World Desert Championship as well as title sponsor for the upcoming Lucerna Hotels & Resorts Tijuana 22nd SCORE Desert Challenge in 2018 and the new Lucerna SCORE Baja 400 in 2019. The new Hotel Torre Lucerna Ensenada, located on Highway 1 on the Northern outskirts of Ensenada will be the SCORE headquarters hotel for all SCORE Baja races in Ensenada starting with this November’s 51st SCORE Baja 1000. Recognized around the globe as two of the very top motorsports extravaganzas in the world that will also start and finish in Ensenada again in 2019, the 51st SCORE Baja 500 will be held May 29-June 2 and the season-ending 52nd SCORE Baja 1000, the Granddaddy of all Desert Races, will be heldNov. 19-24. 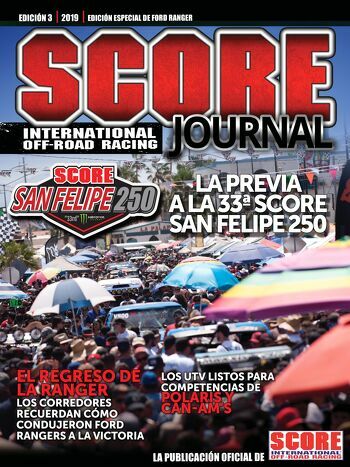 The 2019 SCORE World Desert Championship season-opener for the seventh straight season will be the 33rd SCORE San Felipe 250, to be heldApril 3-7 on the Sea of Cortez side of Mexico’s majestic Baja California peninsula. SCORE racing features the best competitors from all over the United States and as many as 30 total countries. Races feature classes for Pro and Sportsman cars, trucks, UTVs, motorcycles and quads. In order to earn a 2019 SCORE World Desert Championship class point title, SCORE has all four races counting in the season point standings and each driver/rider of record must start and/or finish all four races. With one substitute driver allowed for the year, the driver/rider of record must start all four races to qualify for a season point championship, and no substitute driver/rider of record will be allowed for the 52nd SCORE Baja 1000. Official SCORE Sponsors: BFGoodrich Tires-Official Tire, Monster Energy-Official Energy Drink, King Shocks-Official Shock Absorber, Polaris RZR-Official UTV, RACELINE Wheels-Official Wheel, VP Racing Fuels-Official Fuel, Lucerna Hotels & Resorts-Official Hotel and race title sponsor, Wide Open Excursions-Official Arrive and Drive Company, Crystal Bay Casino-Official Casino.